There is not a lot going on in the vineyard right now, just the usual bits and bobs; wayward shoots to stuff, young vines to train and adventitious growth to nip in the bud. I still have some replanting to do, however. A week ago, I drove over to Novavine, a grapevine nursery in Sonoma, to pick up some green-growing Cabernet Sauvignon (clone 337) bench grafts, but I've been a bit too busy to do anything with them. And now it is forecast to be 100°F, or higher, for the next few days - not exactly ideal planting temperatures. But in they must go. Overall, I am happy with the growing season thus far. Fruit set in all four of Vinoland's grape varieties looks good. I'm a little surprised at how advanced the Cabernet Sauvignon grapes are, despite my almost calamitous timing as to exactly when to begin pruning this year. Apparently the vines have forgiven me. In a quiet corner of Vinoland, forlornly leaning against a California live oak, several dead (or dying) Cabernet sauvignon vines await their final fate - the wood chipper, sigh. I always find it sad when grapevines have to be removed, but for a number of reasons nature just runs it's course; viruses, the health of the initial plant material, gopher blight etc. There are many things that can cause a grapevine to decline and eventually die. Nothing lives forever. So instead of gadding about the Napa Valley like a tourist (although I enjoyed myself immensely yesterday), I spent today in the vineyard. I performed small jobs, training up some young vines and stuffing shoots, whilst Vinomaker dug out the vines that were to be replaced. It was a hard job removing them, as the vines had taken a firm hold in Vinoland (even though the rootstock is the relatively shallow 101-14). I, of course, helped in a supervisory capacity. It's a tough job, but somebody had to do it. Just joking, it was lots of fun showing these four lads around TWWIAGE this afternoon. Giovanni Arcari (winemaker and blogger), Jeremy Parzen (aka Do Bianchi, blogger, food and wine historian, Italian translator and rock musician), Nico Danesi and Andrea Rudelli (both Franciacorta winemakers) were a joy to host. A quick couple of beers in downtown Napa at Norman Rose Tavern, then a really quick glass of wine in Vinoland, and they were off over to Sonoma. Lots of fun. Happy solstice. Grazie e buona notte. Vinomaker doesn't just like Viognier, he loves this particular grape variety and is always looking for new producers of this not particularly common wine varietal. Although his current favourite is Miner Family's, 2012 Simpson Vineyard Viognier (Madera County), this tangent (their lower case 't' not mine) Winery's, 2012 Viognier, Edna Valley AVA (a sub-appellation of the Central Coast AVA) was very nice. And it's always nice to try something that doesn't hail from Napa or Sonoma. The nose on this wine was fairly typical of this varietal; creamy-peach/apricot floral-ness, yum. I, myself, would have preferred perhaps a little more acid, but the peachy-cantaloupe taste bud goings-on were very pleasing. But what made me, and to a slightly lesser extent Vinomaker, really enjoy this wine was tangent's back-story. This winery only makes white wines; Sauvignon blanc, Albariño, Pinot gris, Grenache blanc and this Viognier - isn't that fab? And if not absolutely fabulous, isn't it at least very refreshing? I think so. Each white wine that tangent produces is 100% stainless steel fermented. This winery's approach to winemaking, whilst not totally unique, is still rather interesting - which in turn makes for a rather interesting wine-drinking experience. I must try tangent's other wines. The AVA in which I work. It was a relatively quiet drive to work this morning, and I was early, so I popped out of my Vinomobile and took this photo of an Oakville American Viticultural Area (AVA) sign. 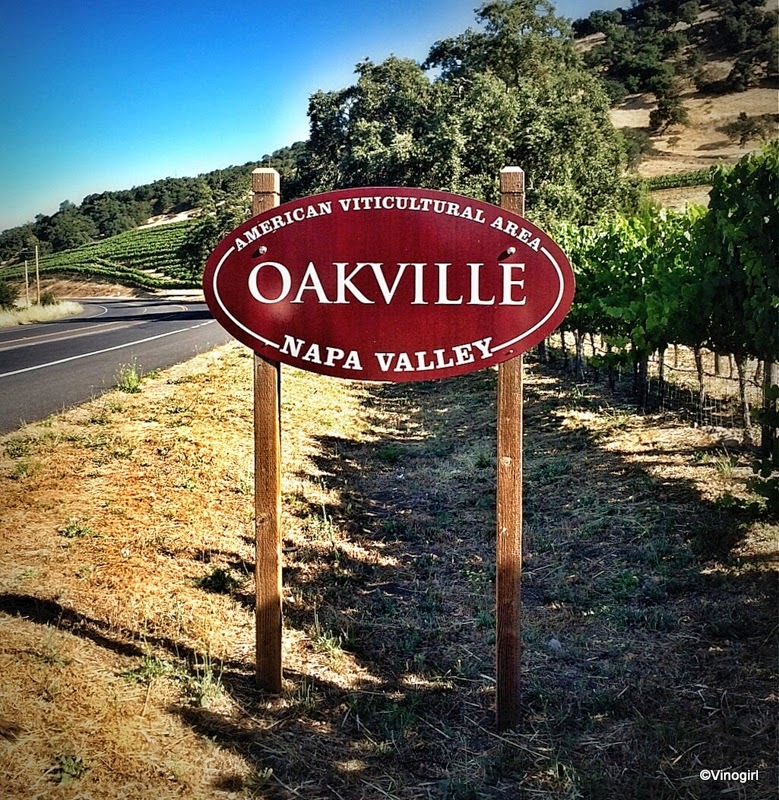 I haven't counted them, but there are probably four Oakville AVA signs in total; two on the Silverado Trail and two on Highway 29, north and south depending on which way you are approaching Oakville. Slap-bang in the middle of the valley, Oakville, which was granted AVA status in 1993, is perhaps mostly known for Cabernet sauvignon production and is currently home to more than 50 wineries. It is quite an expansive AVA stretching from the Vaca Mountains in the east and across the valley floor to the Mayacamas Mountains on the west side of the valley. Oakville has a relatively warm climate, it's very pretty to look at and it's a great place to commute to. Last month I wrote a post about the new Coombsville AVA sign which was recently installed onto a vineyard's fence quite close to where I live. I'm thinking I might make this into a series on Vinsanity, covering each of Napa Valley's AVA signs. This is simply disgusting. Whilst catching up my reading of a few wine related articles at breakfast, I saw this photograph on wineindustryadvisor.com and let me tell you, it nearly put me off my bran flakes. Disgusting, I tell ya! 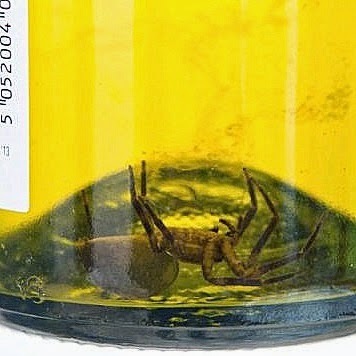 Identified as an Araneus, this two inch long aracnid was found bottoms up, so to speak, by a man in Bristol, England, in a bottle of Tesco Finest white wine he had taken to his mother-in-law's birthday party. Surprise! Considering California has had three rather dry winters in a row, and Vinoland's vineyard has not yet had the benefit of irrigation this year, the Orange muscat vines are growing very enthusiastically. The vines are so enthusiastic that I decided to top them today. It was very cosy inside the verdant, canopy tunnels, but in order to allow more overhead sunlight to penetrate to the lower leaves (and air to circulate), the vines had to be quite severely trimmed back. Topping the vines will encourage more lateral growth, but at this point in the growing season additional photosynthetic potential from new leaf activity isn't a bad thing. ﻿Things are coming along swimmingly in the vineyard; flowering is continuing nicely and fruit set in the Pinot grigio vines looks good, little intervention is needed right now. It's just as well really, as I had a really busy weekend and couldn't devote too much time to the vineyard. On Friday, my TWWIAGE co-workers and I went to an Oakland A's game. It was a long night, but lots of fun was had by all. Saturday evening found Vinomaker and I at BottleRock 2014, with about 30,000 other music enthusiasts, enjoying the second iteration of this local music event. We enjoyed ourselves, but it meant another late night for me. Around noon on Sunday I finally got out in the vineyard, but I wasn't there for very long. What I can only assume was a very mild bout of norovirus literally knocked me off my feet for 48 hours. I never get sick, so this was a bit of a shock to me. I thought norovirus was something people usually contracted on cruise ships, sheesh! I'll think twice about partying with 30,000 peeps the next time the opportunity arises, I'd have been safer in the vineyard.